A major-league catcher for parts of eight seasons, a couple of weeks before receiving the Boston Baseball Writers’ Good Guy Award in January 1973, Duane Josephson was described as “the hustling but hard-luck catcher of the Red Sox.” He was being honored, the newspaper article said, “because he’s a nice guy.” They didn’t know it at the time, but Josephson had already played his last major-league game. He suffered from pericarditis, an inflammation of the membranes that surround the heart, and it had not only truncated his 1972 season but forced him to retire from the game. Josephson enjoyed a good 24 more years back in his hometown of New Hampton, Iowa, but he died much too young, at 54, on January 30, 1997. A right-hander, Josie (as he was usually known) had a major-league playing height of an even 6 feet and weighed 195 pounds. His was a New Hampton life – his parents, Carl and Lucille, were from New Hampton as well. The city was about 3,000 people at the time of his birth on June 3, 1942, the county seat of Chickasaw County in the northeastern part of the state. The family, Josephson’s sister Doris said, goes “way, way back” in New Hampton. Carl was an automobile mechanic and Lucille was a waitress, but they saved and were able to buy a restaurant in town, the West Side Inn. Lucille Josephson was now able to work for herself. The family’s restaurant was “more like a sandwich-type place,” Doris said. “…Mom did serve dinners, but we had a very large school clientele. We were probably 2½ blocks from the high school.” Carl had a third job, too. He hauled mail from the trains. Josie played under college coach Lawrence Whitford, who also coached Eddie Watt, a right-handed pitcher who played eight seasons with the Baltimore Orioles and one apiece with the Philadelphia Phillies and the Chicago Cubs. Though they eyed each other across the field for a couple of years, the first time the two faced each other was in the top of the 12th inning in the July 4, 1968, game at Baltimore’s Memorial Stadium. Watt whiffed his former batterymate. Watt being primarily a reliever and Josephson only once playing in more than 100 games, they faced each other only five times. The pitcher prevailed all five times. Not only did Josie star at sports for his college, he also was named Most Popular Guy in the school yearbook. Josephson’s wife, Nancy, also hailed from New Hampton. The couple had six children. 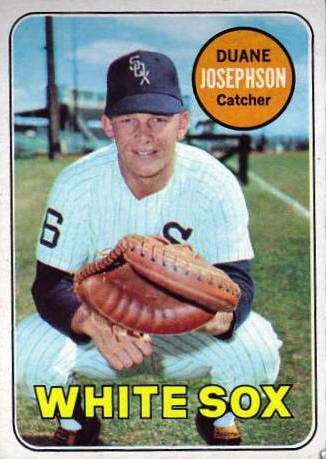 In 1965, Josie moved up to Double A, playing for the Lynchburg White Sox in the Southern League. He hit .300 in 122 games, driving in 65 runs and playing equally well on defense, and was selected all-star catcher. His improved performance at the higher level earned him a September call-up to the majors and he debuted on September 15, 1965, batting eighth in a game against the Angels at Dodger Stadium, catching for John Buzhardt. He grounded out his first time up, but then walked and scored in the fifth and singled and scored in the sixth. The White Sox won the game, 8-1. The single was his only hit of the season in nine at-bats. That winter, Josephson played winter ball in Venezuela. “I’m a line-drive hitter who likes to go with the pitch,” he told Les Koelling in Indianapolis. “If they pitch me away, I’ll go to the right.” Indianapolis manager and former major-league catcher Les Moss was full of praise: “He may be the best catching prospect in baseball today. He has a chance to be one of the great ones.” [The Sporting News, September 10, 1966] “He’s one of the best baserunners on our club,” added coach Ted Beard. Unlike some catchers, he was fairly nimble and fleet afoot. After Josephson’s MVP season, he joined the White Sox again in Chicago and picked up his first three major-league RBIs, hitting .237 in 38 at-bats. He was White Sox manager Eddie Stanky’s choice as first-string catcher heading into 1967. Some felt that Stanky was rushing the youngster. Team vice president Al Lopez, who at the time had caught more major-league games than any other man, agreed with Stanky. The season almost ended prematurely, however, in a March 18 exhibition game when Frank Howard swung hard at a pitch and the backlash of his swing sent Josie to the hospital, bleeding profusely. “I thought he was dead,” admitted Howard, happy to learn that it had taken only eight stitches to close the head wound. He suffered a blood clot in his right shoulder on June 22, 1969, and missed all of July and August, not returning to action until September 8. Ed Herrman and Don Pavletich handled most of the backstop duties that season. Josephson hit .241, appearing in only 52 games. Both the left-handed-hitting Herrmann and Josephson appeared in 96 games in 1970, Herrmann getting a handful more at-bats. The two roomed on the road, and Herrmann named his newborn son Duane. Despite suffering another broken finger on May 7, Josephson was back three weeks later and had by far his best season at the plate, hitting .316 and leading the White Sox, but without as much power as Herrmann. He’d been “ready to play baseball since Christmas,” he declared during spring training, working out all winter on a special weights program. [The Sporting News, March 14, 1970] It paid off, but at the same time, it may have raised his profile enough to make him trade bait for the last-place White Sox, who were anxious to improve their club. The one position where they had the most depth was behind the plate, with another right-handed-hitting catcher in Charley Brinkman, who impressed new manager Chuck Tanner. Josephson was available. “Times have changed,” wrote Larry Claflin in February 1972. “Josephson is practically a forgotten man. He might be a catcher and he might be a first baseman. Or he might be neither.” Carlton Fisk had come on strong. The job was his, and he came through, becoming an All-Star and Rookie of the Year. Josephson had a real scare in the offseason back home in Cedar Falls. He was hospitalized for a two-week bout with pericarditis, losing 18 pounds. “That scared the wits out of me,” he said. Josephson had a wife and six children to look after and he returned to Iowa. There he kept busy, running a sporting goods store he owned named Josie’s and then working in real estate. In his spare time, he helped coach basketball at New Hampton’s high school. Josephson survived a near-fatal heart attack in 1995, and then succumbed to a second one on that early date in 1997. In addition to the sources cited in the text, the author consulted the online SABR Encyclopedia, retrosheet.org, and baseball-reference.com. Interview with Doris Greenland on October 17, 2009 and with Roger Greenland on December 4, 2009.